Simon Martyn-Ellis began playing the lute after finding the classical guitar repertoire too restrictive for ensemble performance: continuo accompaniment remains a mainstay of his activities. 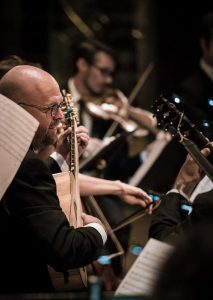 His particular interests are in vocal collaborations, either in opera or intimate recitals, baroque guitar repertoire, and finding the groove in Early Music. But really, he just has a great time making music with people. After undergraduate studies in his homeland Australia, Simon moved to Germany in 2002 to complete postgraduate study with Rolf Lislevand at the Trossingen Hochschule für Musik. During his 11 year stay in Germany, Simon appeared frequently throughout Europe and the US in leading performance venues and theaters with the Akademie für Alte Musik Berlin, Concerto Köln, Salzburger Landestheater, Neue Düsseldorfer Hofkapelle, and the Freiburger Barockorchester, as well as in a variety of chamber music performances. In Australia, he has appeared in numerous festivals including the Melbourne and Adelaide International Festivals, the Peninsula Summer Music Festival, as well as for Pinchgut Opera, The Australian Brandenburg Orchestra, Opera Australia, the Adelaide and Melbourne symphony orchestras, and chamber ensembles such as the Elysium Ensemble, Latitude 37 and Ironwood. Now based in the US, Simon has appeared as a founding member with ACRONYM and Duo Corbetta, as soloist and continuo with Apollo’s Fire and Clarion Society NYC, at the Oregon Bach Festival and with Opera Theatre of St Louis, Handel & Haydn Society, Bach Collegium of Sand Diego, Opera Columbus and Helicon in New York City. He is teacher of lute and related instruments at the Cleveland Institute of Music. Simon can be heard and seen on CD recordings and DVD releases from the Harmonia Mundi, Deutsche Grammophon, Virgin Classics, BIS, Avie, ABC Classics, Vexations840 and Move labels amongst others. He has been recorded for radio and television broadcast countless times in over 12 countries worldwide.